The Great Pyramid of Giza (also known as the Pyramid of Khufu or the Pyramid of Cheops) is the oldest and largest of the three pyramids in the Giza Necropolis bordering what is now El Giza, Egypt. It is the oldest of the Seven Wonders of the Ancient World, and the only one to remain largely intact. Egyptologists believe that the pyramid was built as a tomb for fourth dynasty Egyptian Pharaoh Khufu (Cheops in Greek) over a 10 to 20-year period concluding around 2560 BCE. Initially at 146.5 meters (481 feet), the Great Pyramid was the tallest man-made structure in the world for over 3,800 years. Originally, the Great Pyramid was covered by casing stones that formed a smooth outer surface; what is seen today is the underlying core structure. Some of the casing stones that once covered the structure can still be seen around the base. There have been varying scientific and alternative theories about the Great Pyramid's construction techniques. Most accepted construction hypotheses are based on the idea that it was built by moving huge stones from a quarry and dragging and lifting them into place. There are three known chambers inside the Great Pyramid. The lowest chamber is cut into the bedrock upon which the pyramid was built and was unfinished. The so-called Queen's Chamber and King's Chamber are higher up within the pyramid structure. 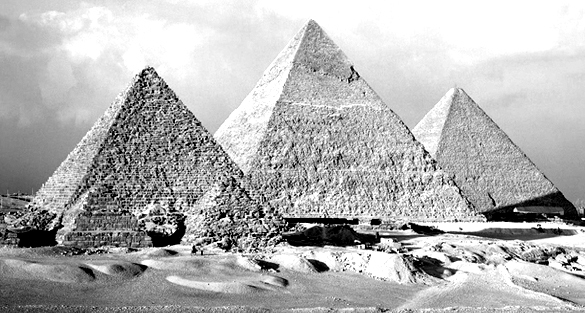 The Great Pyramid of Giza is the only pyramid in Egypt known to contain both ascending and descending passages. The main part of the Giza complex is a setting of buildings that included two mortuary temples in honor of Khufu (one close to the pyramid and one near the Nile), three smaller pyramids for Khufu's wives, an even smaller "satellite" pyramid, a raised causeway connecting the two temples, and small mastaba tombs surrounding the pyramid for nobles. It is believed the pyramid was built as a tomb for fourth dynasty Egyptian pharaoh Khufu and was constructed over a 20 year period. Khufu's vizier, Hemon, or Hemiunu, is believed by some to be the architect of the Great Pyramid. It is thought that, at construction, the Great Pyramid was originally 280 Egyptian cubits tall, 146.5 meters (480.6 ft.) but with erosion and absence of its pyramidion, its present height is 138.8 meters (455.4 ft.). Each base side was 440 cubits, 230.4 meters (755.9 ft.) long. The mass of the pyramid is estimated at 5.9 million tons. The volume, including an internal hillock, is roughly 2,500,000 cubic meters. Based on these estimates, building this in 20 years would involve installing approximately 800 tons of stone every day. Similarly, since it consists of an estimated 2.3 million blocks, completing the building in 20 years would involve moving an average of more than 12 of the blocks into place each hour, day and night. The first precision measurements of the pyramid were made by Egyptologist Sir Flinders Petrie in 1880–82 and published as The Pyramids and Temples of Gizeh. Almost all reports are based on his measurements. Many of the casing stones and inner chamber blocks of the Great Pyramid were fit together with extremely high precision. Based on measurements taken on the north eastern casing stones, the mean opening of the joints is only 0.5 millimeters wide (1/50th of an inch). The pyramid remained the tallest man-made structure in the world for over 3,800 years, unsurpassed until the 160-metre-tall spire of Lincoln Cathedral was completed c. 1300. The accuracy of the pyramid's workmanship is such that the four sides of the base have an average error of only 58 millimeters in length. The base is horizontal and flat to within ±15 mm. The sides of the square base are closely aligned to the four cardinal compass points (within 4 minutes of arc) based on true north, not magnetic north, and the finished base was squared to a mean corner error of only 12 seconds of arc. The completed design dimensions, as suggested by Petrie's survey and subsequent studies, are estimated to have originally been 280 cubits high by 440 cubits long at each of the four sides of its base. The ratio of the perimeter to height of 1760/280 cubits equates to 2π to an accuracy of better than 0.05% (corresponding to the well-known approximation of π as 22/7). Some Egyptologists consider this to have been the result of deliberate design proportion. Verner wrote, "We can conclude that although the ancient Egyptians could not precisely define the value of π, in practice they used it". Petrie, author of Pyramids and Temples of Gizeh concluded: "but these relations of areas and of circular ratio are so systematic that we should grant that they were in the builder's design". Others have argued that the Ancient Egyptians had no concept of pi and would not have thought to encode it in their monuments. They believe that the observed pyramid slope may be based on a simple seked slope choice alone, with no regard to the overall size and proportions of the finished building.